Both Democratic Candidates for Superintendent for Public Instruction Kathy Hoffman and David Schapira have reported that the agenda for the June 25 State Board for Education meeting includes an item that calls for a “presentation, discussion and possible action regarding the Board’s authority to take disciplinary action against certified educators.” Both candidates fear this is an opening for reprisals against teachers who took part in and organized the Red for Ed movement and walkout in April. This agenda item should be stricken from the agenda if its intent is to pursue an avenue to discipline educators who actively participated and are active participants in the Red for Ed movement. It was inappropriate and unbecoming for Superintendent Douglas to make this suggestion just before the walkout in a televised interview (see link below) and it is wrong to entertain, if this is an attempt at reprisals against the instructors that participated and led the movement in April and may lead others if necessary, these McCarthyite and vindictive vendetta measures now against people exercising their constitutional rights and fighting to make education better for all stakeholders. Next articleLD 23 State House Candidate Eric Kurland sees 2018 as a Referendum on Public Education. I have a better idea. Abolish the Arizona Board of Education. We do not need a state level board to manage our schools. The Board is nothing more than an affront for political manipulation and ideologies. The political parties can’t get into every school district to inject their believes so they create an entity that they can control and give it authority. After all, who provides the candidates for superintendent. Take it from someone who is a registered independent in this state. Because I refuse to join an “approved” political party, I have less say as a voter. The Board is just another tool being used in that same effort to minimize all of us as participating citizens, especially if we do not agree with them. What ever happened to compromise? It does solve problems because both sides have a stake in the outcomes. Compromise does not create winners or losers, it creates the opportunity to succeed, to move forward. Of course you have to want to solve problems in the first place. Getting back to the Board, being that they are the authority looking down from on high, the only recourse they could take is to inflict punishment. That is what authoritarian bodies do. I only hope it is corporal punishment and not capital punishment. Unfortunately, the punishment fits the crime. Hey, you never know in this day and age. Those teachers had no right to protest in the streets, in a peaceable fashion. That is un-American. Therefore, those of you at the bottom of the hierarchal pyramid must suffer the consequences of your unauthorized actions. It has nothing to do with the fact that the Board is failing our educational system in this state. Why would we dare to hold the authorities accountable. I will see you at the gallows. In truth and sarcasm, Jim Ely. I agree! There is really no good reason for a state board when it only serves to impose its ideas rather than to enhance the quality of education. You also say, “Because I refuse to join an “approved” political party, I have less say as a voter.” That’s true but why would you choose to have less say? Some of us share many ideas and a philosophy so we band together in parties to promote our positions. You should reconsider your choice to stand alone. 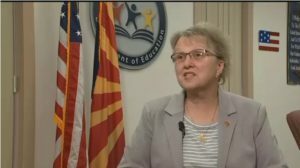 According to a report in a statewide press, the chair asked for a legal opinion on the board’s responsibility if they get complaints regarding teacher actions during red for ed. I saw that in the Arizona Republic this morning. Complaints should be handled and processed according to the normal procedure already set in place by the Department. There should not be special cases for the people who participated in the walkout. That would be an infringement on their constitutional rights. How about going to the meeting and suggesting that this could be used to dismiss any educator who supported or even hinted that they support Donald Trump? After all, he is engaging in behavior detrimental to children and we wouldn’t want anyone who supports such behavior anywhere near our children. Also check 7e regarding comment policy on teacher discipline matters. I don’t know if this is related or not. I don’t know where to see back up material for each agenda item. Does anyone in the audience know? The supplemental material does not appear to be up yet when you click on meeting materials. All that shows is the meeting agenda. I would check n Friday. Any exhibits should be up then. Nip it in the bud. Do not allow this to happen or we will never get anyone certified and qualified to teach in this state ever again!